08.05 -- 14. 06. 2013. When selecting art pieces for this exhibition, one work led to another. 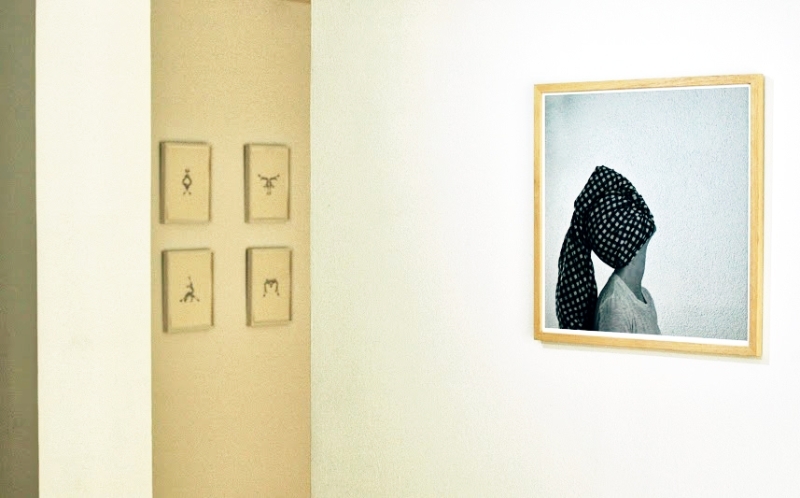 A “self-portrait” placed near the entrance, a woman's bust with her head wrapped up in a tablecloth, (Tablecloth by Csilla Klenyánszki) recalled the collages by Vlatka Horvat (Anatomies), who has also become known by her “hiding” self-portraits. The symmetrical, almost decorative patterns composed of photos of the artist's own bodyparts, convey feelings of alienation, agression and absurdity, and at the same time, the inherent playfulness of the countless possible combinations. The collages led to the artist's modified notebooks (Topographies) that imply similarly ambivalent mental processes, and on them even the folded, crumpled grid of the chequered tablecloth reappears. And then these diary-topographies showed the way to the loose groupings of collages and drawings by Andreas Werner, to the icebergs, lonely ships, and to block-like, mysterious buildings, which reinterpret the Romantic notion of the sublime on the boundary of landscape and abstract imagery. Finally, the thread ended at a young woman looking into the camera with an enigmatic expression on her face (Sári Ember, a photo from the Daffodil series), sitting on the seashore as if this was a blown-up detail of a landscape by Werner; with a caption that says: "sometimes her face looks feminine and sometimes it looks masculine and she never knows which one she is showing just this minute." The works shown in the exhibition Paperboats reveal and conflate formal and mental dichotomies. They express, on the one hand, a drive to come up with an articulate form, a need for an order of (geometric) composition and, on the other hand, feelings of the void appearing under one's feet, of insecurity, alienation and disappearance. It is physical presence or absence (the human body and face, often fragmented or concealed), the relation of body to personality or to its surroundings that is being interpreted in various ways; next to the objectified (rearranged, re-composed, scrutinized) human figures, the presented objects and landscapes gain an anthropomorph reading. All four artists think and work in series (even though in two cases, it was possible to pull out a single piece), and all the artworks exhibited are on paper. While Klenyánszki often operates with performative methods for her self-portraits, one of the stakes of the works by Horvat to test how much paper as a medium can yield, that is, how far its performative power can be extended. There is something uplifting in a precisely folded paper boat as it sails away on the waves, belying its material. Slowly but surely physics will prevail and the soaked paper will submerge in all probability. Still, or just for this reason, the ones who float paper boats never give up seeking the perfect form and the delicate balance of the launch.